Pegasus Technologies has extensive experience designing and producing High Frequency (HF) and Very High Frequency (VHF) driver amplifiers for cyclotrons. Cyclotrons are used to accelerate charged particles for physics experiments and in the production of medical radioactive isotopes. The particles are confined in a cylindrical vacuum chamber by a direct-current magnetic field while being accelerated with an oscillating electric field, which is supplied by the RF power supply. Each cycle of the RF wave gives an additional &QUOT;kick" of energy to the particles which increases the radius of their orbit inside the cyclotron. Once they reach the desired energy they strike a target material within the cyclotron or are extracted through an external beam line. Most cyclotrons require RF power in the range of multi-kilowatts. This level of power is usually produced by vacuum tube amplifiers. We work with our good friends at QEI Corporation who produce these high power amplifiers while we produce the driver amplifiers and the control panels. For a cyclotron to operate efficiently (or at all!) a number of parameters must be controlled, many of which change dynamically during operation. With respect to the RF system, the most fundamental parameter is the resonant frequency of the cyclotron. The cyclotron can be modeled as a very selective resonant tank circuit and the resonant frequency will drift during operation. The amplifier signal source /controller must constantly adapt to this drift. Pegasus has developed control algorithms for tracking the resonance during operation in order to maximize cyclotron efficiency. Our cyclotron controllers generate the RF signal with one-Hertz or finer frequency resolution which allows the control algorithm to always use the proper frequency. Another challenge to generating and maintaining high voltage RF potentials within a cyclotron is the "multipacting" effect. As RF voltage levels increase, there is a point at which excess free electrons are knocked loose from the internal metal surfaces via secondary emission. The Pegasus RF controller avoids this problem by carefully controlling the initial start-up pulse shape of the RF drive. Additional circuitry monitors for the occurrence of arcs and other abrupt changes in the cyclotron RF load, and automatically protects the amplifier and cyclotron. Cyclotrons frequently require an RF amplitude leveling feature. The Pegasus controllers can be commanded to hold RF level to a user-defined value and maintain that level based on an RF feedback sample from the cyclotron. Every cyclotron design is different and requires expert knowledge of their care and feeding. Let Pegasus Technologies design and produce the controller for your next cyclotron, or for your high-power physics experiments! This unit combines the cyclotron RF controller with amplifier status control and metering. By combining these functions, Pegasus was able to simplify and reduce the cost of the RF power supply system. 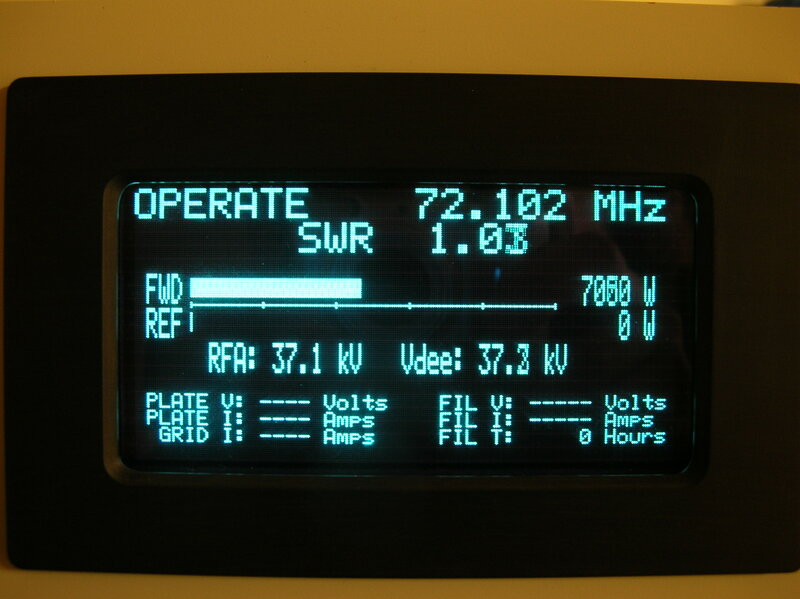 Close up of the RF Controller / Amplifier Controller display. The controller is shown in the "Operate" condition where the amplifier output of 7 kW produces an accelerating potential of 37 kV inside the cyclotron. Controller algorithms constantly adjust the operating frequency to maintain the minimum SWR (standing wave ratio). Example of an 800 watt 72 MHz solid state driver amplifier. A display is provided for Forward and Reflected power, DC voltage and current. Display of another cyclotron signal source operating at a nominal 101.500 MHz. This controller also includes the resonant frequency tracking feature and an accelerating voltage leveling loop.